"Illusion's Game. 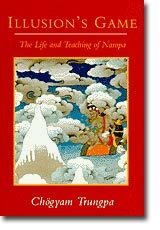 The Life and Teaching of Naropa "
In what he calls a "200 percent potent" teaching, Chögyam Trungpa reveals how the spiritual path is a raw and rugged "unlearning" process that draws us away from the comfort of conventional expectations and conceptual attitudes toward a naked encounter with reality. The tantric paradigm for this process is the story of the Indian master Naropa (1016-1100), who is among the enlightened teachers of the Kagyu lineage of the Tibetan Buddhism. Naropa was the leading scholar at Nalanda, the Buddhist monastic university, when he embarked upon the lonely and arduous path to Enlightenment. After a series of daunting trials, he was prepared to receive the direct transmission of the awakened state of mind from his guru, Tilopa. Teachings that he received, including those known as the six doctrines of Naropa, have been passed down in the lineages of Tibetan Buddhism for a millennium. Trungpa's commentary shows the relevance of Naropa's extraordinary journey for today's practitioners who seek to follow the spiritual path. Naropa's story makes it possible to delineate in very concrete terms the various levels of spiritual development that lead to the student's readiness to meet the teacher's mind. Trungpa thus opens to Western students of Buddhism the path of devotion and surrender to the guru as the embodiment and representative of reality.